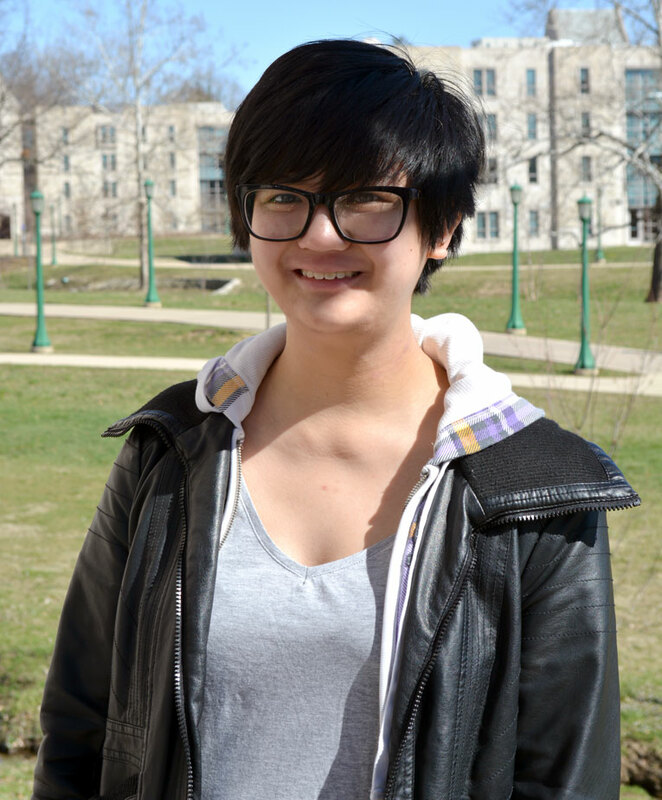 If you’ve been enjoying the Asian American and Pacific Islander Heritage Month celebration at IU Bloomington this April, Alyssa de la Rosa is among the people who deserves your gratitude. A junior operations management major at the Kelley School of Business, the Paducah, Ky., native has been working at IU Bloomington’s Asian Culture Center, an Office for the Vice President for Diversity, Equity, and Multicultural Affairs (OVPDEMA) program, since her freshman year. For this year’s heritage month celebration, de la Rosa spearheaded Asia Night, an event that brought together student organizations from all Asian and Pacific cultures at the Buskirk-Chumley Theater. “It’s the first time we’re doing this event. In past years, the student groups did an event called Southeast Asia Night. That was with six student groups—the Philippines, Vietnamese, Thai, Singaporean, Malaysian, Indonesian. There wasn’t one last year, so this year, Melanie wanted to revive it,” explained de la Rosa, who contacted the different groups, coordinated nine performances from different cultures and publicized the event. “At first, it was just the Southeast Asian groups. I went to a meeting to represent the Fliipinos, and there were a couple other groups there. But participation amongst those groups was not so good, so I asked Melanie if we could open it up to all Asian and Pacific cultures. “All the heritage months, I think, are important. I think having a time to focus on highlighting Asian and Pacific cultures is important, because as a minority, the majority or mainstream culture gets the spotlight, so having this set-aside time is really special. I’m in the Filipino American Association, so our biggest event is in April. It’s just a time to focus on our culture,” she added. The daughter of Filipino immigrants who came to the U.S. in the 1980s, de la Rosa learned of the ACC during Welcome Week, soon after her arrival on campus and after attending a handful of events, volunteered to help work on the center’s website, using her self-taught ability to code in HTML and CSS. I’ve met a lot of people from events the ACC has held. For freshmen especially, there’s a lot of social events where you can meet a lot of people and at the discussion events. While she’s involved with other organizations on campus—including being treasurer of the Hoosier Pops Orchestra and being chairperson for HHART, an annual arts showcase in which Hutton Honors College partners with the Hudson & Holland Scholars Program, an OVPDEMA program—it’s obvious how meaningful the ACC (especially director Melanie Castillo-Cullather and program associate Sarah Stamey) is to de la Rosa. “I’ve met a lot of people from events the ACC has held. For freshmen especially, there’s a lot of social events where you can meet a lot of people and at the discussion events, you see a lot of the same people because they’re recurring visitors at the ACC. But I think the biggest thing is that Melanie and Sarah are the most important people on campus in my life, so just getting to know them, they’re really nice to have. They write letters of recommendations for me, but every time I’m in the center, we always chat about stuff happening in our lives. I get to hear all about Melanie’s kids and I can tell her about any problems I’m having or good things in my life,” said de la Rosa, a recipient of a Hutton Honors College scholarship.